Alex Muller says it is only a matter of time before someone gets taken by a shark at a Capricorn Coast beach. THE species of shark responsible for mauling to death a swimmer off North Stradbroke Island is lurking in numbers off popular Capricorn Coast beaches. "Personally, I think it's only a matter of time before someone gets taken,'' Yeppoon professional fisherman of 30 years, Alex Muller, said yesterday. "Actually, I hate to say it, but I'm surprised it hasn't happened already. Up to three bull sharks are believed responsible for killing 21year-old Sarah Kate Whiley as she swam with friends at Amity Point, off North Stradbroke Island, on Saturday. Within seconds they had torn off Ms Whiley's arms and savagely mauled her torso and legs. Department of Primary Industries and Fisheries statistics released to The Morning Bulletin show 161 sharks were caught in the 54 drumlines off the Capricorn Coast during 2004 and 2005. Of those caught, 50 were tiger sharks, 45 were bull whalers and 35 were black-tip reef whalers. Hammerhead sharks and spottail whalers were also caught. Mr Muller is the son of legendary local fisherman, the late Wally Muller (who mapped the Swain Reefs), and operates an 11-metre (36 foot) line-fishing boat out of Rosslyn Bay. He said while the deadly predators may be out of sight, they were definitely out there. He had last week spoken to spearfishermen who were "chased out of the water'' by bull sharks at Corio Bay and Flat Island. In recent weeks Mr Muller has seen schools of sharks, including bull and tiger, chasing prey in Keppel Bay. "There were a lot of bait schools in the bay this morning (Tuesday),'' he said. Mr Muller, who does a lot of work about 144km (90 miles) off the coast, said he had no problem getting in the water out there to spearfish. Mr Muller said the surf made the water murky in close to the beaches. "Bull sharks are pretty unpredictable things. "In clean water they're very wary, but in dirty water they just operate on scent and feel. Department of Primary Industries and Fisheries Shark Safety Unit acting manager Tony Ham said there were 54 drumlines from Farnborough to Emu Park. 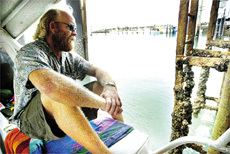 "The major type of species caught in the region has been tiger sharks rather than bull sharks,'' he said. "Bull sharks have also been caught in the Fitzroy River.'' Mr Ham said the shark program would remain the same.